The Mascarene Parrot (Mascarinus mascarinus) is an extinct species of parrot known from bones, specimens and descriptions to have occurred in the Mascarene island of Réunion, and possibly Mauritius. The bird was first described by Dubois in 1674. During the latter half of the 18th century, a number of birds were exported alive to France and kept in captivity; the species was described after these examples came to the attention of the taxonomists of that time, like Brisson, Linnaeus and Buffon. Three stuffed specimens were preserved at that time. Today, two remain, accompanied by a number of bones found later. One, the sole remaining of the three extant around 1800, is in the Muséum national d'Histoire naturelle in Paris, the other, dated 1806 and of unknown provenance, in the Naturhistorisches Museum in Vienna. The Mascarene Parrot was a medium-sized bird, about as large as an Eclectus Parrot and of a similar shape, although less heavyset and with a longer tail. It was dark greyish brown on the upperside, lighter on the underside. The bases of the tail feathers were white, and the head was colored a medium lavender grey. A ring of velvet-like short black feathers surrounded the bill, which was brilliant red. The feet were reddish brown. The "evidence" for this bird's former existence on Mauritius rests on the testimony of Peter Mundy, who saw "russett parratts" in 1638, and Johann Christian Hoffmann, who saw "red crows with recurved beaks and blue heads" called Indiaensche ravens ("Indian Crows") in the early 1670s. An illustration in the report on van Neck's 1598 voyage refers to "Indian crows" twice the size of parakeets and being two- or three-colored, but the animal depicted does not agree well with the Mascarene Parrot. All these reports are often taken to argue that the Broad-billed Parrot was multicolored and that Lophopsittacus bensoni was a valid species that was the "grey parrots" also mentioned by the early travellers. However, the Broad-billed parrot was in all likelihood flightless and thus it seems that the above-mentioned reports are more consistent with Mascarinus mascarinus. Hoffman states that the birds flew only "with difficulty", though, whereas the wing bones of the Mascarene Parrot does not suggest a reduction in flying ability. The sternum of the bird is only insufficiently known and thus it may be that the species flew badly. This, on the other hand, is in disagreement with the theory that the same taxon occurred on both islands, although Hoffman may have referred to a general unwillingness to fly until pressed, which was common for the unwary birds of the Mascarenes. Most strongly against the former existence of this species on Mauritius, however, weighs the fact that no skeletal material has turned up in the extensive collections of subfossil bones recovered to date; the fossil record of Mauritius is the most complete of the Mascarene Islands. By 1800, the captive birds seem to have died except one in the possession of Ludwig I of Bavaria. 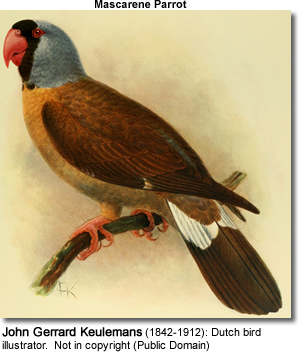 Bory de Saint-Vincent does not mention the bird in his description of animals encountered on Réunion in 1801, and it seems to have gone extinct in the wild by then. The Bavarian bird was figured by Carl Wilhelm Hahn in 1834 or 1835; it must have been quite old (but not necessarily unusually so for a parrot) at that time and can be assumed to have died not too long afterwards. The corpse seems to have been discarded; Hahn's depiction was the last record of the species being alive. If the species had existed on Mauritius at all, it must have disappeared at a much earlier date; Hoffman's record is the last that would agree with this species, and while the 18th century reports, vague as they are, could refer to M. mascarinus too, they most likely describe parrots that had been introduced and gone feral at that time. The reason why the species should persist on Réunion markedly longer than on Mauritius, in face of the same threats faced by it on both islands, are another puzzling aspect of the species' history.